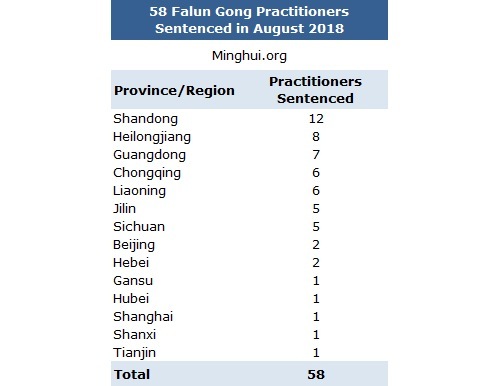 According to information received by Minghui.org, the month of August 2018 recorded 86 new cases of Falun Gong practitioners sentenced to prison by the Chinese Communist Party’s (CCP) court system. Among the 86 new cases, 58 practitioners were sentenced in August 2018, and 28 were sentenced earlier in 2018. Many of these cases did not follow legal procedures. Mr. Gong Peiqi, a retired colonel, was sentenced by the Beiqu District Court in Qingdao City to 7 years of imprisonment with a fine of 20,000 yuan. Officers confiscated more than 120,000 yuan from Mr. Gong, but only about 70,000 yuan were recorded in the verdict. 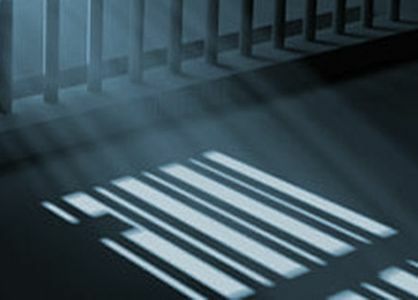 Ms. Zhang Shuxiang, 81, was sentenced to four years of imprisonment without an open trial or her family being notified. Among these practitioners are highly educated professionals. For example, the Longgang District Court in Shenzhen City sentenced two computer professionals, Dr. Feng Shaoyong and engineer Chen Zeqi, to 8 years of imprisonment each. The Changping District Court in Beijing sentenced Dr. Wang Liangqing, a former researcher at China Academy of Launch Vehicle Technology, to two years of imprisonment with a fine of 2,000 yuan. The Liwan District Court sentenced Wang Jiafang, Associate Professor in mathematics at Guangzhou University, to 3.5 years. Among the 58 practitioners who were illegally sentenced, the terms range from 6 months to 8 years and average 3.6 years. Some of the practitioners are in their 70s or 80s. These 58 practitioners received fines totaling 261,000 yuan, or 4,500 per practitioner on average. The median fine was 6,000 yuan, and the maximum was 60,000 yuan. Ms. Yu Guirong lives in Nenjiang County, Heilongjiang Province. She was arrested on April 17, 2018, after being reported to police for distributing Falun Gong informational materials. Her leg was broken in May while she was detained at Qiqihar Second Detention Centre; the cause of the injury is unclear. She was released after her daughter paid a 10,000-yuan bail. Doctors installed a metal plate in Ms. Yu’s leg to help her heal. While recuperating at home, she received news in August that she had been sentenced to three years in prison. With the metal plate still in her leg, Ms. Yu was taken back into custody and taken to prison shortly afterward. Ms. Wang Jiafang’s latest arrest occurred after a conversation she had with a local resident while walking in a park near her home on September 8, 2017. Because she mentioned Falun Gong in the conversation, she was reported to the park security office. Five officers forcibly threw her out of the park. After Ms. Wang further contacted officials to explain Falun Gong and the persecution to them, officials reported her to the police, leading to her arrest on October 27, 2017. The police detained her at the Yuexiu District Detention Centre. There, a guard kicked her, and she had acute pain in her liver. After several months of detention, her hair had turned gray. Two weeks after a court sentenced a Falun Gong practitioner to three years with four years’ probation, it revoked the sentence and gave the practitioner a one-year prison term. Ms. Cui’s family was informed by the court on July 25 that she was sentenced to three years with four years’ probation. She was also required to attend brainwashing sessions twice and do community service once a month. The authorities did not immediately release Ms. Cui upon the announcement of the sentence. A lawyer and a staff member from the Ji County Justice Bureau visited Ms. Cui at the Rizhao Detention Centre in early August. They asked her whether she still practiced Falun Gong. She told them that she still did the exercises to alleviate her headaches. Ms. Cui’s in-laws, both 86, have been asking about her after not seeing their daughter-in-law for nearly five months. Her family has not told them about her sentencing, fearing that the news would cause them too much distress. Dr. Feng and Mr. Chen were tried on December 1, 2017, by the Longgang Court. Their lawyers argued that the persecution of Falun Gong was illegal, that the computers and other electronic devices confiscated from the two men were their personal or employers’ lawful possessions, and that there was no evidence that they had caused any harm. Mr. Wang, a practitioner in his 50s, began to practice Falun Gong in 1995. At the time, he was working at the China Academy of Launch Vehicle Technology, the premier space launch vehicle manufacturer in China. A retired colonel was recently sentenced by a Chinese court to 7.5 years in prison for not giving up his faith in Falun Gong. His daughter, a San Francisco resident, has appealed to the Chinese communist regime for her father’s release. Despite his lawyer’s defense and his daughter’s tireless efforts to free him, the judge handed down the 7.5-year sentence on July 20, 2018, and fined Mr. Gong 20,000 yuan.